Relax with a Glass of Noble Vines Without Breaking The Bank! I am a huge wine fan (what mother isn't??!!) but I can't afford to spend a ton on a bottle of wine! So I am always on the hunt for affordable but quality, delicious wines! I have found all those qualities in Noble Vines - one of my favorite brands of wine! 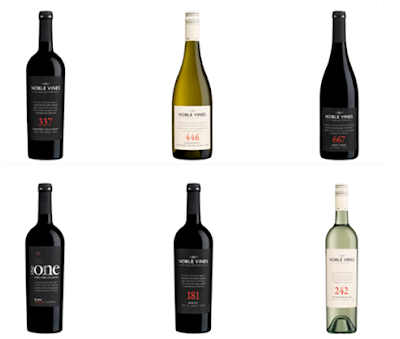 Noble Vines collection of affordable, yet quality wines are farmed in the red, cobblestone soils of their family-owned vineyards in Lodi and on the gentle slopes of their cool-climate San Bernabe Vineyard in Monterey, California. 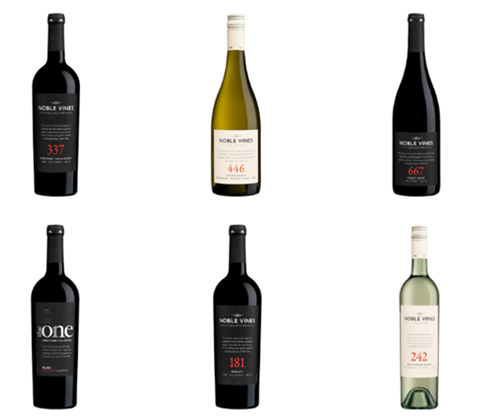 Noble Vines produces exceptional grapes to harvest six succulent wines. They marry the most admired vines with sustainable winemaking innovation crafting wines with concentrated flavors, silky fruit and soft, supple tannins. Best of all, they’re all under $20—check them out below! 337 Cabernet Sauvignon – Exhibiting appealing aromas of black cherry, ripe currant, fresh herbs and lightly roasted coffee, the supple tannins and balanced acidity support from its core flavors can be enjoyed on its own or with herb roasted pork loin, baked chicken, barbecued stead and sautéed mushrooms. 446 Chardonnay – From a beloved Chardonnay vine, this medium-bodied wine offers delightful aromas of ripe pear, pineapple and melon with hints of lemon and toasty vanilla spice. This wine can be also be enjoyed on its own or with soft cheeses, seafood, salads, and pasta in wine or cheese sauce. 667 Pinot Noir – Enfold yourself in the plush tannins and balanced acidity support core flavors of ripe Bing cherry, juicy plum and delicate hints of soft, toasty oak, making it the appropriate wine for dinner parties—enjoyable with nearly any cuisine including salmon, roast lamb, or salads with cheeses or nuts. The ONE— Dark fruit flavors carry through beautifully to the palate ending with a touch of pepper. Merlot leads the way in this fruit-forward blend followed by Cabernet Sauvignon and Zinfandel. The addition of Zinfandel adds a touch of softness to the final blend. Noble Vines One red blend offers inviting aromas of blackberry and toasty oak followed by luxurious notes of lush black cherry and pepper with a long and lingering finish. 181 Merlot – A classic merlot, 181’s fresh fruit flavors of currant and cherry mingle gently with spicy cedar and vanilla is the flawless companion to pasta with sausage and roasted peppers or a pan seared steak with mushrooms and parsley. 242 Sauvignon Blanc – Medium bodied with a round mid palate and bright acidity, this refreshing wine offers flavors of guava, passion fruit and a hint of lemon zest. Enjoy it on its own or with just about any seafood or spicy food. It is really hard to pick just one favorite out of these Noble Vines wine varieties. I really liked them all and with different foods and at differenct occasions! If you are looking for a quality wine that won't break the bank, try Noble Vines! You can purchase Noble Vines wine at your local spirits retailer.